What's on the inside of a black hole? This question seems both easy to answer and impossible to ever know. For those who aren't too familiar with black holes, these strange astronomical objects are one-way roads in the universe. Small, compact, and incredibly dense, their gravitational pull is so strong that nothing, not even light itself, can escape their clutches. Hence the name: black hole. Outside of a black hole everything is fine and dandy - you can go about your normal interstellar day. But once you cross a certain threshold, called the event horizon, you're trapped. Forever. Try as hard as you can, fire your rockets at full blast, and it will be to no avail. You simply cannot escape. What's worse, you can't even call for help or talk to a friend in your final moments. Since light can't escape, no signals you emit will breach the event horizon and propagate outwards. SOS all you want - nobody will hear you. 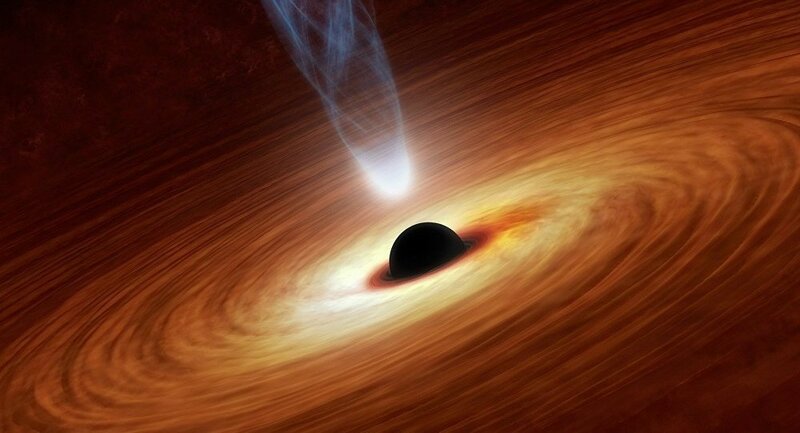 As crazy as black holes sound, we have solid evidence that they exist. We have a hard time spotting the creatures themselves (they're pitch black, after all) but we can see gas and dust fall to their doom as they get swallowed. And while those light shows are a blast to watch, as soon as the material gets swallowed by the event horizon, it's lights out. Once you fall through the event horizon, your days are numbers. Depending on the size of the pit that just ensnared you, it will take anywhere from a few microseconds to a few regular seconds before you're crushed into the infinitely dense point - the singularity - in the center. No matter hard you fight, no matter where you point your rocket, you are mathematically guaranteed to fall into oblivion. But...how do we know? If no signals can escape the clutches of a black hole, and we've never been inside of one, and even if we went inside of one we would never be able to tell anyone what we found, then how do we know? How can I state with any confidence at all what will happen to you if you fell into a black hole? The answer is math. Mathematics is the language physicists use to understand and describe nature. In this case, we use Einstein's theory of general relativity. This theory was used, after Einstein, to predict the very existence of black holes, and to tell observers what to look for in their searches for them. And as far as we can tell, this theory is able to completely describe everything we've seen about them. And even though our observations stop at the event horizon, our mathematics don't. The same math that predicts how black holes behave tell us exactly what goes on inside, and vice versa. The interiors and exteriors of black holes are united by a common physics. If you understand one, you automatically understand the other. That's the power of mathematics, and one of the reasons it's so widely used in the sciences: it enforces strict logical consistency. Which is nice. So as long as general relativity holds up in explaining everything we can see about black holes, we can use it to describe everything we can't see. Of course things might change - general relativity may end up breaking down and failing to explain some sort of observation. Its replacement, whatever it is, might give us a different picture of the interior. But that's okay too - science constantly updates its knowledge in all areas, not just black hole guts.